Love'N Those bangles is a bracelet with substance. It's made to make a statement. 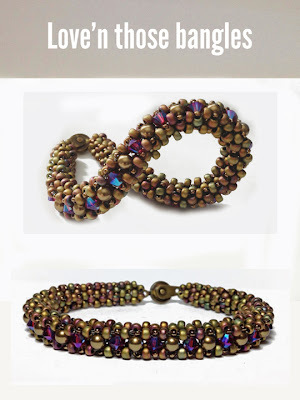 Created with bronze glass pearls and Ruby AB crystals. Tiny bronze embellishments sparkle with in the design. Dress it up or dress it down this bangle bracelet it is perfect for day time or a night on the town. Created with Jade glass pearls and crystals. Tiny bronze embellishments sparkle with in the design. Dress it up or dress it down this bangle bracelet will be your favorite all summer long. Are you in Bangle Mood? jade and bronze! Beautiful combination. 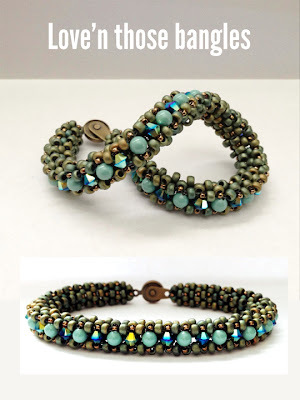 Love these colors, love this bracelet!!! !